By now, you probably know our dirty little secret: We order Thai food on Sunday. Every Sunday. And it’s delivery. There, I said it! OK, fine. We eat it in stretchy pants while watching Netflix and Hulu. Are you happy? Our Thai food rotation has been a mix of Mango Curry, Spring Rolls, and Pad Thai (recipe in 31 Meals). And our current obsession? Papaya Salad. Because green papaya can be quite difficult to find, I’ve recently been making an inspired version that relies on carrot and kale instead. I think you know where this is going. This recipe is simple, requiring just 30 minutes to prepare. The base is shredded carrot and lime-sesame massaged kale. Curry-Spiced Cashews add protein and healthy fats (and a TON of flavor). 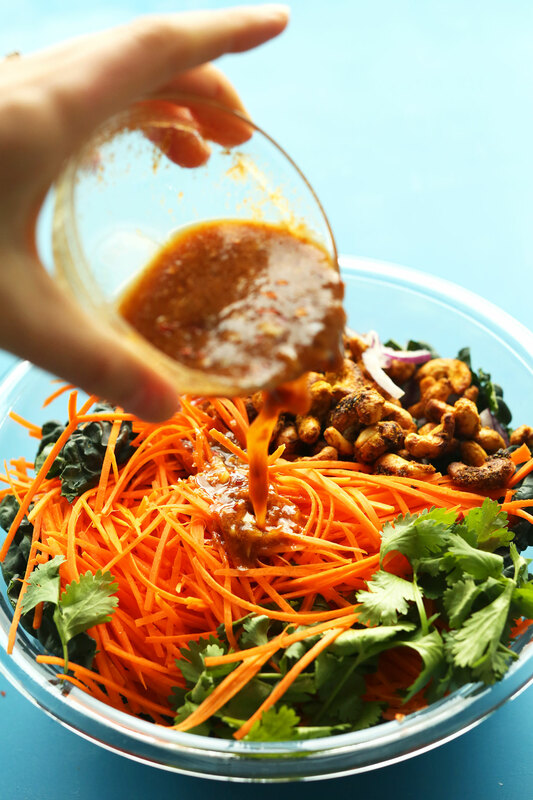 And the peanut-chili-lime dressing takes this salad to the next level. It’s tangy. It’s sweet. It’s sour. It’s spicy. It’s perfect. This would make the perfect meal when you want something light and fresh but still hearty. It’s a lovely stand-alone entrée, but would also pair well with my Mango Curry! If you try this recipe, let us know! Leave a comment, rate it (pretty please? ), and don’t forget to tag a picture #minimalistbaker on Instagram! We’d love to see what you come up with. Cheers friends! 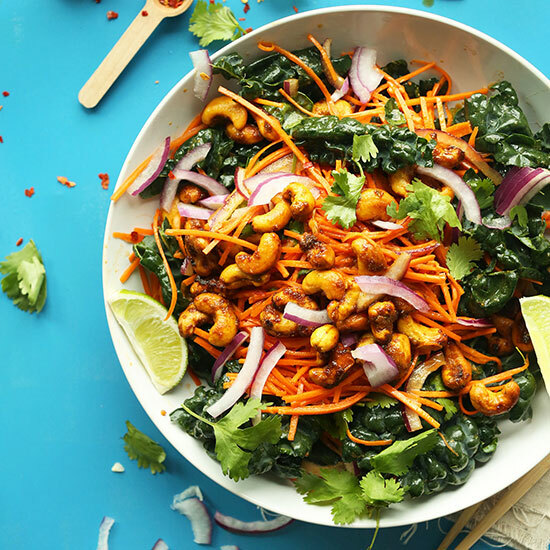 An easy, 30-minute Thai-inspired carrot and kale salad with a savory-sweet dressing and curried cashews! Flavorful, hearty, so delicious! Add garlic, peanuts, and chilies to a mortar and pestle (or just mince very finely) and crush to make a paste. Then add coconut sugar and crush once more. Add lime juice, pineapple juice (optional), and tamari and stir to combine. Taste and adjust flavor as needed, adding more coconut sugar for sweetness, tamari for saltiness, lime juice for acidity, or crushed bird's eye chili for heat. Set aside. To a large mixing bowl add kale and drizzle with a bit of olive or sesame oil and lime juice. Massage for 10-15 seconds to soften and remove some of the bitterness. 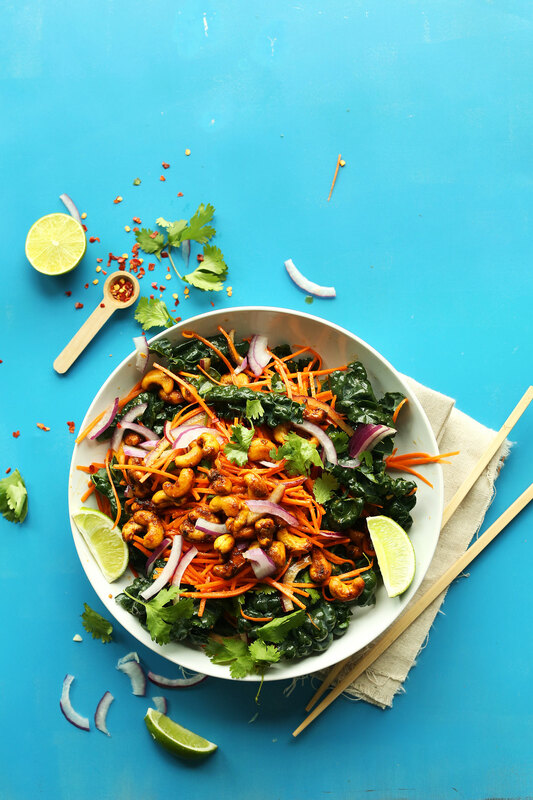 Add shredded carrot, red onion, cashews, and cilantro (optional). Then add dressing and toss to coat. Serve immediately. If storing for later, store the cashews and dressing separately to keep fresh. Salad will keep in the refrigerator up to 2 days. Dressing will keep for 5-7 days. *2 cloves garlic yields ~1 Tbsp minced garlic. *Nutrition information is a rough estimate calculated with peanuts, sesame oil, and pineapple juice, but without other optional ingredients. An excellent recipe! An all time favorite! MB never disappoints! This was sooooooo good and it didn’t even taste like you were eating kale? Great salad recipe, very quick to make. I cut down on time even more by making the dressing in a blender instead of a mortar and pestle. Used spinach for the greens since that’s what I had on hand. Will make again! Wow, get ready to hop on the train to flavor town!! Mine didn’t look as picture perfect as this… it looked mostly like shredded carrots but once you take a bite pow, hits you with so much goodness. My husband was losing his mind over this too! It didn’t even feel or taste like carrots! – first use a food processor for shredding all those carrots, it’s a lot of carrots! I used the mandolin before I even thought about using my food processor. Save your arms! – I made the curry-spiced cashews and I had to cook them for atleast 4 min. beyond the recipe, my oven is a little weak. They still seemed chewy and moist but when they cooled a little they got more crunchy which is what you want for this salad. I also accidentally put the lime zest on before baking and it still turned out fine. This reminded me of an asian coleslaw… I think it would be great on a pulled pork sandwich. Could probably leave the pork pretty basic and let this salad bring all the flavor! OMG, drooling! This was so delicious and so nutritious. It was a huge hit, served with fresh baked french bread. My additions were 3 fresh pineapple spears, chopped into bite sized chunks. I purchased these from a local food shop and used the juice for the optional pineapple juice. And also, 1/3 cup dried cranberries. I used low salt cashews plain since there was already quite a bit of prep and I just did not have the time to make the curried version, although I am sure they would have only added another dimension to the dish. I also added the cilantro. A wonderful summer supper for 2-3 as a main course or 4 as a side dish. Thank you! What a fantastic recipe, just made this for dinner and loved it. Had a turtle brownie straight from the freezer for dessert too :) Thank you for all your hard work and sharing of delicious recipes. I’m so obsess with this salad !! Is amazing!!!! Thank u so much for sharing!!! My taste buds dance of happiness ( like always when I try your recipes ). Thank you, Dana! This salad is absolutely delicious! I made it with the peanut butter, red pepper flakes, and maple syrup options, along with just freshly roasted cashews. We served it alongside marinated, grilled chicken and it was a perfect meal! Thanks for the recipe! Super yummy and a great way to get in kale without juicing it. The only point to note about this salad is that it is quite high calorie and doesn’t keep you full for long. Amazing combination of flavours and looks beautiful. I’ve made it twice: version 1 had peanut buttter, no pineapple and dried chiles. Version 2 had dry roasted peanuts (ground to a paste), pineapple and red pepper flakes. I preferred the first with more of a hot sour zing. My new favourite kale salad, and definitely worth cutting carrots to matchsticks rather than shredding coleslaw style. I just used curry powder and maple syrup on the cashews. Will be a birthday dinner standard around here! Thanks! I made this for dinner tonight – massive hit! I served it with oven roasted potatoes. Great combo! OMG…this was delish and easy to make! My guests loved it! Thanks! Definitely a go to salad! The dressing is the most traditional and delicious dressing I have eaten outside a Thai restaurant. I didn’t add the pineapple juice or peanuts, but I am sure the juice is a nice addition the the already-flavorful dressing! The added curry cashews made the dish a satisfying meal. I substituted a baby kale/butter lettuce blend for the kale which was less bitter for me. I will definitely make this salad again. This was delicious!!! Thank you for the great recipe! AMAZING!!! Double the sauce and the cashews to be sure you have leftovers! Had no kale one time, just used chopped crunchy lettuce. Another time, served it all over a stir fry with Taste of Thai brand rice noodles. The combination of flavors is truly delicious. Made this for a Memorial Day Picnic and it was a *huge* hit! I added a sliced yellow mango to the salad and subbed in two more tablespoons of pineapple juice in place of the coconut sugar in the dressing (to accommodate a friend who was not eating anything with added sugars). It was delicious! Thank you, thank you, again, Dana, for such a wonderful recipe! This is my new go-to recipe blog. Grabbing the ingredients tomorrow and making it for dinner. Looks fabulous and healthy! I made this for lunch yesterday, and it was delicious! Everyone loved the curried cashews and I had to hide them otherwise I would not have any left for the next time I make this salad (which will be on Tuesday). The only thing I changed was using raw sugar because I did not have any coconut sugar in the house. I just love your recipes and you are now my go-to website for vegan recipes! Just wondering if you think this would be ok with romaine? I made this last night for my birthday dinner, and holy crunch factor, it was SO GOOD!! The flavors complement each other so nicely, and I loved how fast it was to put together. My mom and aunt are usually quite chatty over dinners, but they were unusually quiet minus occasional moans of bliss. Lol My husband told me to print the recipe and post it on the fridge so I can make it again in a hurry. I think this one’s a keeper. I did add lime and pepper shrimp skewers for extra protein. Perfect meal for the heat we’re getting in CT! Can I use something other than kale?? Try spinach! I also subbed cilantro for fresh mint and it worked perfectly! Sure! Whatever green you want. This salad is really good. Left out the sugar all together and added some avocado. Eating the leftovers from my lunch yesterday now and planning on making it again tomorrow! Thanks for the great recipe. It’s hot this week in NY and salad is pretty much all I can stomach. Perfect timing. I think mango juice would work perfectly! good luck. Wow this looks amazing! I am always on the hunt for new, unique salad recipes to try. Definitely pinning this one! 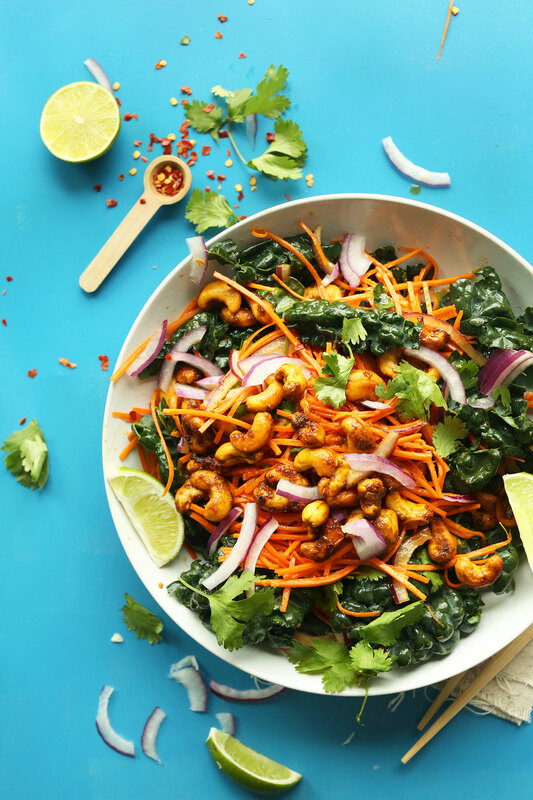 Wow, this salad is packed with protein even though there’s no major plant protein sources besides cashews! The spice and nutty flavors will go so well with the kale and carrots! You had me at curried cashews! What an awesome lunch or dinner idea! I can’t wait to try this! And I just wanted to take a minute to thank you for the way you do your recipes. The notes about substitutions and optional etc is so helpful with all my odd allergies and I am so much more inclined to give them a try than the recipes where I have to guess at what may or may not work! You’re awesome! ? Of course! I have allergies so I get it! Hope you love this one, Tesia. This looks so crazy delicious! Can’t wait to try it out. Since I got your cookbook, every single lunch I take to work is Minimalist Baker lunch. A new one to add to the list! Sounds & looks like a great replacement for delivery! Would love a big bowl of this right now. This looks incredible. I love all your Thai recipes and they’re on regular rotation in my house, so I’ll definitely have to try this one!